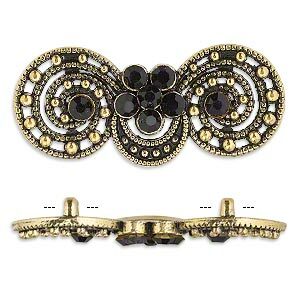 Spacer, antiqued gold-finished "pewter" (zinc-based alloy) and Czech glass rhinestone, black, 37x14mm 2-strand fancy double circle. Sold per pkg of 4. Item Number: H20-A3067FN Have a question about this item? 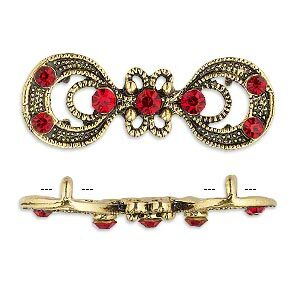 Elaborately detailed "pewter" (zinc-based alloy) spacers feature an attractive antiqued finish and Czech glass rhinestone accents. Each spacer has four loops to accommodate double-strand designs. 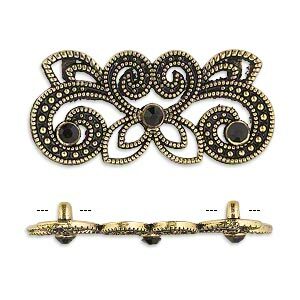 Spacer, antiqued gold-finished "pewter" (zinc-based alloy) and Czech glass rhinestone, black, 39x17mm 2-strand fancy double circle. Sold per pkg of 4. Spacer, antiqued gold-finished "pewter" (zinc-based alloy) and Czech glass rhinestone, light Siam, 37x14mm 2-strand fancy double circle. Sold per pkg of 4. 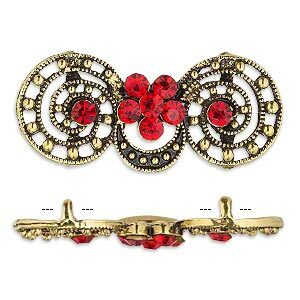 Spacer, antiqued gold-finished "pewter" (zinc-based alloy) and Czech glass rhinestone, light Siam, 39x17mm 2-strand fancy double circle. Sold per pkg of 4. 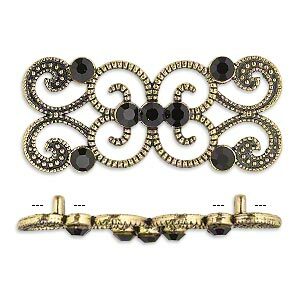 Spacer, antiqued gold-finished "pewter" (zinc-based alloy) and Czech glass rhinestone, black, 41x17mm 2-strand fancy rectangle. Sold per pkg of 4. 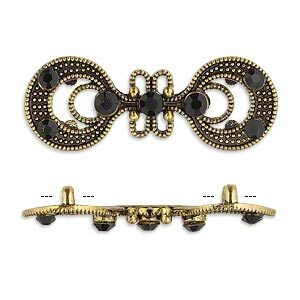 Spacer, antique gold-finished "pewter" (zinc-based alloy) and Czech glass rhinestone, black, 35x15mm 2-strand fancy rectangle. Sold per pkg of 4. 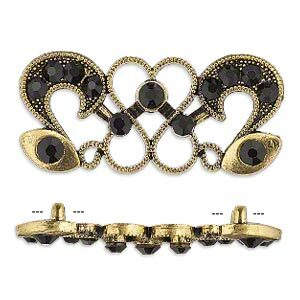 Spacer, antique gold-finished "pewter" (zinc-based alloy) and Czech glass rhinestone, black, 39x16mm 2-strand fancy rectangle. Sold per pkg of 4. 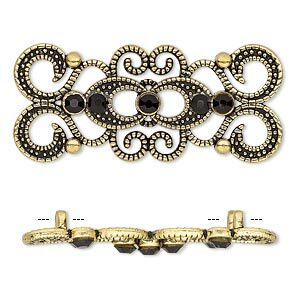 Spacer, antiqued gold-finished "pewter" (zinc-based alloy) and Czech glass rhinestone, black, 37x16mm 2-strand fancy rectangle. Sold per pkg of 4. 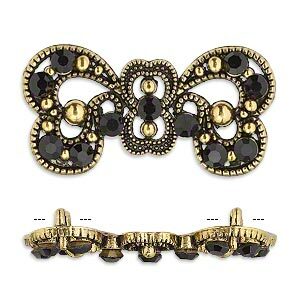 Spacer, antiqued gold-finished "pewter" (zinc-based alloy) and Czech glass rhinestone, black, 37x17mm 2-strand fancy bow. Sold per pkg of 4. 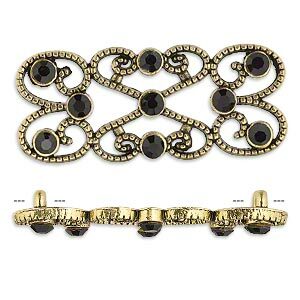 Spacer, antiqued gold-finished "pewter" (zinc-based alloy) and Czech glass rhinestone, black, 40x19mm 2-strand fancy rectangle. Sold per pkg of 4. 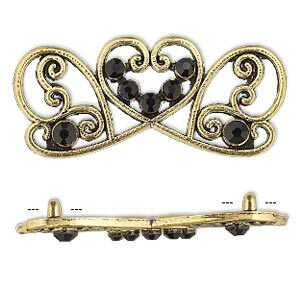 Spacer, antiqued gold-finished "pewter" (zinc-based alloy) and Czech glass rhinestone, black, 39x18mm 2-strand fancy rectangle. Sold per pkg of 4.